And another release on Dumpsterscore. 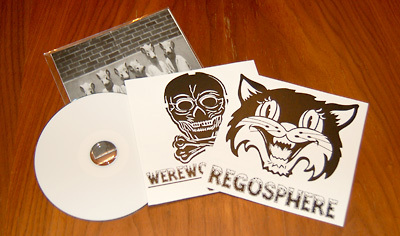 This time it’s a split-release between Werewolf Jerusalem (another offspring of the hyperactive Richard Ramirez) and Andy Dumpsterscore’s own project Regosphere. The disc kicks off with a 18:46 minute harshnoise-wall by Werewolf Jerusalem entitled „Night Of The Skull“. Sounds like another reference to horror-movies or stories, but there is no more information given on the concept of the tracks. The wall is really heavy on the crunchy lower mids. Not that much going on in the super-low-frequencies, but the overall-sound is saturated very well and gives a nice warm feeling. The subtle use of higher frequencies adds to that impression. There are some nice crackling textures going on, but most of the time the wall is extremely static and non-evolving. Instead of collapsing the wall fades out nicely. Next up are two tracks be Regosphere, clocking in at 6:33 and 8:50. Only knowing the „Nature knows“ bizcard cd-r (which is think is exellent) I am quite curious to hear some more material by this promising project. „Empty promise“ centers around a high-pitched, modulated synth-sound, which is accompanied by some very distant mid-freuency drones and some more high-frequency synth-sounds. The track has a somehow calm and dreamy sound, but there is a feeling of tension which is present during the whole 6:33. I waited for noise-hell to break loose at any time, but instead I was given some fine constructed and layered synth-sounds without any harshness at all. Interesting. And then, at about 5:10 the sounds fade out, there is a moment of silence until some distant and calm drones creep in, creating an ambient-feeling that I‘d like to compare to some of Michael Page’s Sky Burial material. The second track is called „Initiation“ and it is the complete opposite of „Emtpy promise“. Harsh, powerful, aggressive. Again a lot of synth-sounds are use. There is a ryhtmical-pattern of deep and distorted synth blast, combined with some high-pitched shrieks. The vocals are completely gutted, super distorted and super aggressive. Due to the rythm of the synth the track is slow-paced, but because of the harsh distortion-textures and the hectical high-frequencies (sounding like an theremin) the aggression-level is very very high. The concept is more similar to the mentioned bizcard cd-r, the sound however is more clean and digital here, while the bizcard had a somehow more analogue and warm sound. For my personal taste the track is a little too long. Boiled down to 4 minutes and focused on the core-motives. The release comes in a slipcase with a b/w-cover printed on heavy paper. Inside one finds the cd-r and two inserts, consisting of two one-sided prints each, done on heavy paper and glued together. The prints have a somewhat pop-aesthetic and form a nice contrast to the merciless harshness of most of the material.